Sarasota waterfront real estate Guide: search luxury waterfront homes and real estate in Sarasota, Longboat Key, Siesta Key and view homes for sale in oceanfront communities of Southwest Florida. Annette Smith with Allen Real Estate Services presents Sarasota MLS listings,news, area info, photos and updates. 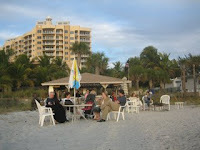 The Tiki Bar at the Beach Residences on Lido Key is a fun places for visitors and owners of Lido Key condos, new and resale waterfront complexes in Sarasota. You can view virtual tours and search your preferences for a new condo such as Orchid Beach Club, or a re-sale condo like Lido Beach Club, right next to the Beach Residences. Go to Lido Key Condos and view all condos listed in the Sarasota Board of REALTORS® MLS database of homes and condos right here! Lido Key is conveniently located and walking distance to St. Armands Circle, famous shopping area. Stroll and people watch, shop or dine at world-class restaurants on this Key. Still confused about the Keys? Check out Sarasota Condos. If you get frustrated and aren't familiar with Sarasota, just email us your criteria and we'll automatically send information on island condo communities that match your list of "wants". Looking for a spectacular home or waterfront property in the Sarasota area? We cover all Sarasota Keys! For all your Sarasota real estate needs, call Annette Smith or John Allen or send us an email for condo information today! Sarasota Florida offers an active lifestyle filled with culture, golf, beaches, excellent shopping, world-class restaurants and outstanding health and medical services in a tropical coastal setting.